A scratch, a dent, a ding – all of these may be a part of your 20 or 40-foot repurposed shipping container or - they may not be. These steel storage containers have literally traveled half way around the world to land at your business location to assist with simplifying your operations. While the condition of these containers vary, each comes with its own ‘type’ associated with it. We have written about the designated container types in prior Boxpert Blog posts. Our Boxperts’ work to understand the needs of our clients and ensure that the product that arrives at our clients’ doorstep is modified to the desired specifications, falls within the ‘type’ designation selected, and completely meets the needs for the clients’ business operation. Our team focuses on a few key questions at the beginning of the clients search for the right product. Questions to Ask our Clients- What should You Consider? Is this repurposed shipping container for storage or for living/office use? It is important to determine the end use so that the appropriate and correct product quote and information can be provided. Dimensions, modifications and interior layout are all specifications to consider prior to delivery. Is this conex box a customer/client facing structure? The functionality of the conex box may not change with the exterior condition. A few dents or dings will not affect the integrity of the structure or the wind and watertight guarantee. The appearance of a pristine structure may be needed and should be determined upon product selection. If pristine appearance is not necessary, a steel storage container that has seen a few miles and has the surface to show it may be a perfect selection. If you've chosen a modified container, have you considered your interior needs? It is important to understand the dimension requirements both interior and exterior in regards to the use of your container. You can refer to our most recent interior design blog for a complete list of interior design planning considerations. The frequency of use, elements and interior space planning are all important considerations for your repurposed shipping container. Our goal here at Falcon Structures is to deliver the right product meeting all of the requirements our clients have designated. 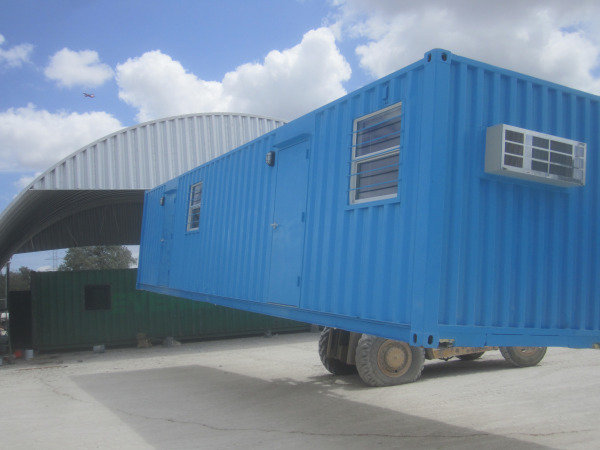 Our Boxperts work closely with our customers to gain a full understanding of the client needs and develop a solution with our fleet of 20 and 40 foot repurposed shipping containers to meet their business requirements. To speak to one of our Boxperts directly about your needs call us at 877-704-0177.